Level Up Village courses promote design thinking and one-to-one collaboration on real-world problems between K-9 students at more than 50 schools in 12 states and students at over 30 Global Partner organizations in 19 countries. All schools that enroll in LUV’s Global Inventors course receive a free 3D printer, plus fully developed curricula, teacher training in CAD, basic electrical engineering and printer operation, as well as experienced management of the global collaboration process. U.S. school partners directly sponsor Global STEAM education in developing countries through LUV’s “take a class, give a class” model: a portion of the tuition is used to deliver the same class to students at one of LUV’s Global Partner schools, many of whom are living on less than $2 a day. The world’s largest and most active open source prosthetics community, e-NABLE has catalyzed a global network of more than 6000 volunteers worldwide, including makers, designers, engineers, artists and kids to use their 3D printers and design skills to create free 3D printed prosthetic hands, with the goal of providing them to underserved populations around the world. The organization recently received a $600,000 grant from Google.org to support the mission of the e-NABLE community. The e3STEAM kickoff was moderated by eNABLE Educators’ Exchange Coordinator Rich Lehrer, a National Faculty member for the Buck Institute for Education and an eighth grade science teacher at Brookwood School in Massachusetts, who has involved his students with 3D printing e-NABLE devices for his son. “The goal of e3STEAM is to empower young people to become agents of positive change in their own lives and in local and global communities by virtue of their involvement in the building and receiving of 3D printed hands. By doing so, we will provide them with an inspirational 21st century model of the power of collaboration, creativity, critical thinking, service, and technology,” said Rich Lehrer, e3STEAM Exchange Coordinator. Participants in the Hangout were familiarized with the goals of the e3STEAM initiative, heard from experienced educators who have involved their students in eNABLE’s mission of 3D designing and printing low cost mechanical hands and disseminating them to those who need them, and found out how they can join the movement. 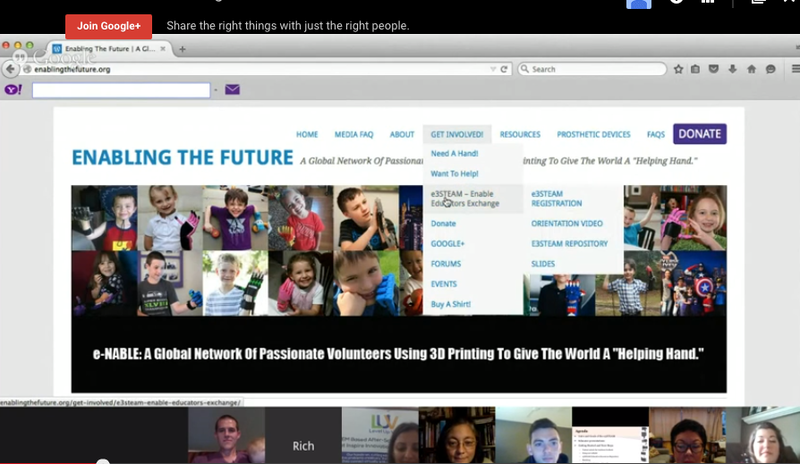 The e-NABLE community is an open community founded by Jon Schull in 2013 to crowd-source the design, fabrication, and dissemination of 3D-printed prosthetics for children and others missing fingers or hands The volunteer community has grown continuously since then, and has already delivered hundreds of devices to recipients in at least 37 countries. The Enable Community Foundation was founded in October 2014 to support the mission and operations of the e-NABLE community. The community’s public-facing website is http://enablingthefuture.org. Their nexus for collaboration is a google plus community with thousands of members, at http://bitly.com/e-nable. More information about obtaining a device, volunteering, partnering, donating, or sponsoring can be obtained by emailinginfo@enablingthefuture.org. For more information about the eNABLE Educators’ Exchange, please visit http://bit.ly/1UkPIps, and to watch the recorded broadcast, please visit https://plus.google.com/events/cvr3ad2dv8urlqq9ina5d579p50.